Italian director Matteo Garrone returns to UK cinemas this week with a movie a world away from the English-language fantasy Tale of Tales. Crime flick Dogman is a solid effort bearing the influence and heritage of Neorealism and Federico Fellini. 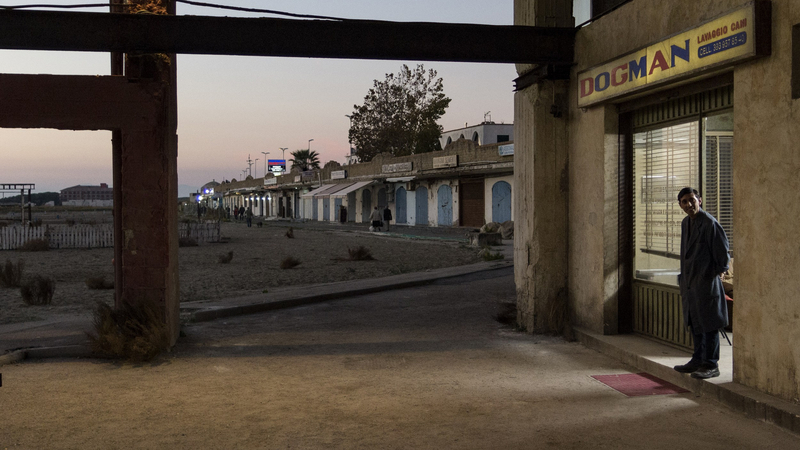 Marcello (Marcello Fonte) is a dog groomer living by the seaside on the outskirts of the eternal city. Timid-looking and slight in build, he loves dogs and clearly feels more at home in their world than the human community. But for all his kindliness and friendliness, Marcello is devious, a lowlife crook (he deals coke) and a bit of a schemer. Simone (Edoardo Pesce) is Marcello’s worst nightmare. A brick shithouse thug terrorising the neighbourhood and everybody in it, the hulking bruiser thinks the owner of Dogman (Marcello’s business) is the perfect person to bully and dominate. It’s an apex predator and prey relationship, like watching a leopard chase down a baby gazelle, having picked it out from the pack, and the film’s title aptly captures both Marcello’s joy in canine companionship and Simone’s bestial nature. Garrone’s latest is in direct communion with the spirits of Federico Fellini and Pier Paolo Pasolini. He has conjured their influence in intriguing ways. The brutish Simone is like a psychotic version of La strada’s Zampanò and the poverty-stricken setting is straight out of Pasolini’s early films, such as Accattone and Mama Roma. Fonte, too, has one of those rough and interesting faces Pasolini adored and were lit so memorably by Tonino Delli Colli. Marcello, with little dog Jack by his side, also brings to mind Vittorio De Sica’s masterpiece, Umberto D.
The drama unfolds as a David versus Goliath battle between the sheer brutish force and presence of Simone and the craven but sneaky Marcello. A movie about pair of losers running out of options, it is centred on the mafia code of omertà (aka keeping shtum) and gets plenty of dramatic mileage out of the inherent disaster in misplaced loyalty. Marcello’s grave error is to think he can reason with the self-destructive Simone, if he gives him everything he wants. But you cannot placate a savage beast any more than you can a person hopelessly lost to addiction. The liminal space where the film unfolds – a poor neighbourhood buffering sea from land – is strikingly sparse and at nighttime lit like a movie set, lending Dogman not just a heavily stylised look, but a palpable eeriness. This is a place where perhaps local law enforcement fears to tread and dead bodies are found on the beach, or in the tall grass, as kids playing soccer might stumble upon torched and still-smoldering charred human remains, while collecting an errant ball. Bad things happening is a way of life here, and the story of Marcello and Simone represents a sort of fatalistic, yet humdrum, destiny. Involving and well made, rather than something flat-out great and essential, Garrone’s crime picture is too humble and small-scale to be a serious best of year contender.